Description: Designed for the Sega Genesis. Box Text: This will change the way your play. 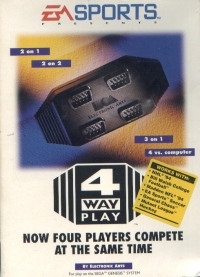 4 Way Play lets up to four players compete at the same time. Perfect for tournament play. 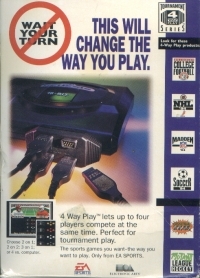 The sports games you want -- the way you want to play. Only from EA Sports. This is a list of VGCollect users who have 4 Way Play in their Collection. This is a list of VGCollect users who have 4 Way Play in their Sell List. This is a list of VGCollect users who have 4 Way Play in their Wish List.